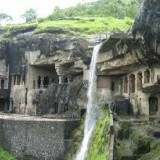 Aurangabad-ajanta-ellora is one of the Popular City (Destination) in India with more than 50 thousand population. Aurangabad-ajanta-ellora is well connected with it's surrounded cities through Bus & with some local transporations. Book Online bus Tickets to & from Aurangabad-ajanta-ellora in Bestbus at very low and cheap prices. Bestbus offers Online Bus Tickets Booking from Aurangabad-ajanta-ellora and to Aurangabad-ajanta-ellora. Dirrefernt types of buses were running through Aurangabad-ajanta-ellora including Hi-Tech AC, Multi-axel Volvo, Volvo B9R Multi-Axle Seater, Semi Sleeper and Sleepers in both A/c as well as Non A/c Buses.